The Digital IXUS 330 is a compact elegant camera full of features for complete picture-taking control. The ergonomically designed cross-key controls make this camera easy to operate. 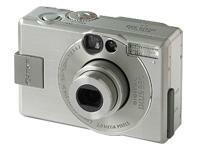 The Digital IXUS 330 features a high-quality 35-105mm (35mm equivalent) 3x optical zoom lens, with a bright maximum aperture of f2.7. Its 2.0-megapixel CCD captures even the finest details. Canon's latest intelligent three-point focusing system AiAF (artificial intelligence auto focus) and evaluative exposure systems ensure the subject is always in focus and correctly exposed. The camera incorporates a unique "intelligent-orientation sensor" making the camera aware of which way you're holding it up. The Digital IXUS 330 also supports Canon's Direct Print printers. Direct printing is the quickest and easiest way to get photo-quality prints without a PC. Simply connect the camera to the printer, select the image on your camera, and print. With the 330's movie mode, it is possible to capture movie clips up to 30 seconds with sound and, by making use of the video lead supplied, the camera can be connected to a TV set, to view and share photos and movies. With the "My Camera" function the camera can be personalized by adding sounds and pictures. The Digital IXUS 330 is fully automatic, with a built-in flash firing when needed, however the more adventurous photographer can have greater control by accessing the camera's more advanced features. Users can choose between two metering modes (Evaluative and Spot, with AE lock), select from a range of White Balance settings (auto, 5 preset and custom), alter the equivalent ISO film speed setting (from ISO 50 to 400) and control the flash. The Photo Effects option allows images to be taken in vivid color, neutral, sepia and black and white. There is also a Stitch Assist mode for taking panorama shots that can be merged using the supplied PhotoStitch application. Going digital means easy connectivity between the camera and your PC's USB port opening up the whole new world of digital imaging. Canon's software suite for PC/Mac includes user-friendly Canon ZoomBrowser EX, PhotoStitch and PhotoRecord. This camera comes with a high-power Li-ion rechargeable battery pack.